Used for treating benign prostatic hyperplasia and prostatitis and for preventing prostate cancer. Contains phytosterols recognised for improving urinary symptoms and increasing maximum urine flow. Inhibition of epithelial and stromial prostatic cell growth. Inhibition of inflammation by the eicosanoid tract. Inhibition of cellular proliferation due to excess Dihydrotestosterone (DHT) by antagonism to the activity of 5-alpha reductase and by the desensitization of the cellular receptor to DHT. An anti-mutagen activity on prostatic cells in vitro, probably by selective apoptose induction (programmed death). Reduction of the toxic effects of cadmium, a probable inducer of prostatic hyperplasia. Prostaphil™ has been the object of several vast open studies and of several double-blind studies in which its activity has been compared with placebos or with other known inhibitors of benign prostate hypertrophy. In general, 60 to 90% of the subjects obtained significant improvements within 1 to 3 months. 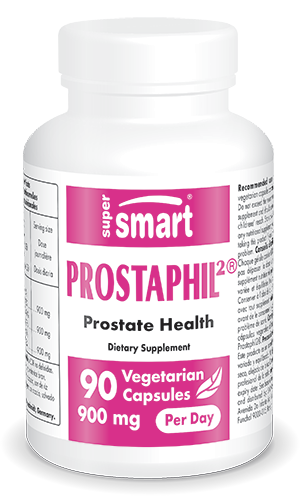 In particular, Prostaphil™ has shown its ability to inhibit cancerous prostatic cell growth (a disease which can affect, to different degrees, nearly one in three men) is an extra argument for including this product in your preventive supplementation diet. For optimal efficacy, it’s possible to combine a number of natural active ingredients such as in the formulation ProstaNatural Formula. This includes flower pollen and several other plant extracts such as Urtica dioica, Serenoa repens, Pygeum africanum and Collinsonia canadensis. In this respect, you may also be interested in the prostate-protective effects of lycopene, a powerful antioxidant found in tomatoes. Each vegetarian capsule contains 100?mg of R-lipoic acid.